I've been wanting to go to Yakitori Totto for ... 2 years now? A friend of mine told me of a Japanese place in NYC that was supposed to change my life, and he gave me the address. Not the name though ... and it turns out there's a different restaurant on the first floor at the same address and I ended up there, 2 years ago ... (it was good - a kaiseki restaurant). This year I had to go. With a week full of restaurant reservations though the only time I could go was my last night, right before my 8:30PM flight. Totto opens at 5:30 PM but having nothing else to do/buy (post-shopping) I walked there at 5:00. They wouldn't let us in but while we were debating whether to wander around and come back or not the line started to form ... by 5:20PM the stairway was full of people waiting in line. Good thing I didn't leave! The yakitoris were about $3.50 a piece and there was a minimum order of I-can't-remember-how-much-bcs-it-didn't-matter. 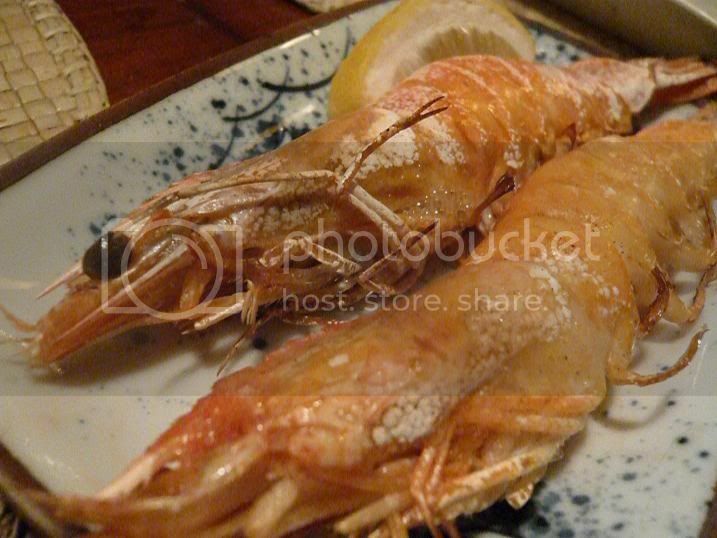 At least the min order can include non-yakitori items, unlike certain LA yakitori places! 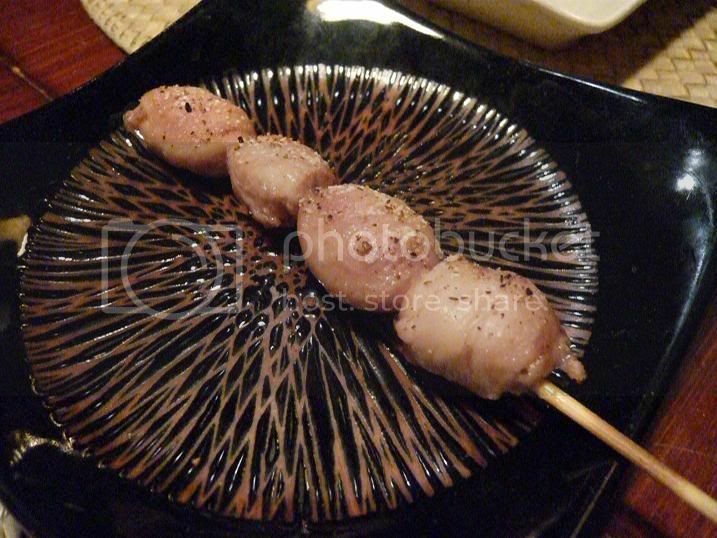 Great flavor and texture - they are bits of chicken neck wrapped around the skewer, chewier and firmer than usual meat. Maybe even a wee bit cartilagenous, but not much. Loved it, loved it. This was also very good. Delicious, tender little things. Although I was still in heaven from my chicken neck ... mmmm. We also had some tamago, made with free range Jidori chicken eggs. Amazing. One of the best I've ever had - very flavorful eggs This wasn' t exactly to my taste. It was crisp but had the stickiness that didn't really agree with me. 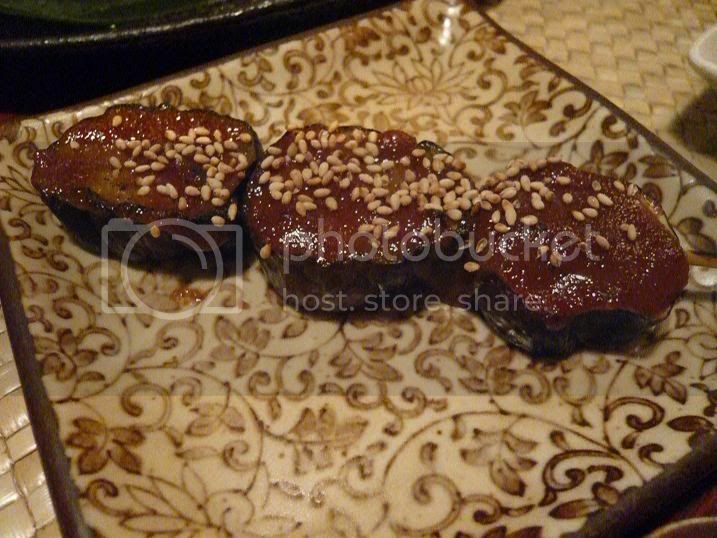 We also had some miso eggplant. Good. Pretty standard grilled eggplant with miso. The chicken parts are definitely the highlights at this place, so get the other stuff for fillers only. We also tried their daiginjyo tofu. The tofu was steaming in front of us for a while. The server comes and serves it to you when he/she thinks it's ready. Soft, smooth tofu and nothing else. Very simple and delicious. Compared to your usual "tofu" this has a stickier texture - maybe even more like a pudding. 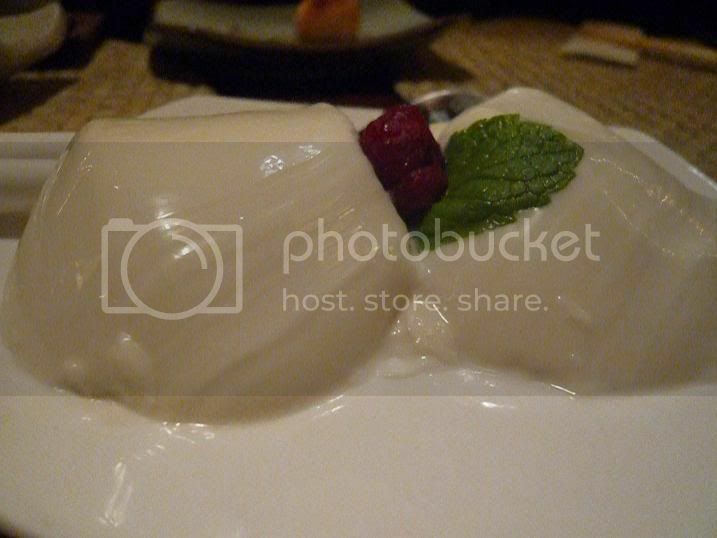 Just the right amount of sweetness and quite refreshing, I really liked this dessert! I absolutely loved Totto. It's the best yakitori I've ever had (although I never got to try Bincho before they closed the yakitori part down - but I highly doubt it can beat Totto). I plan to come back and try the rest of the menu! See all my NYC posts here. 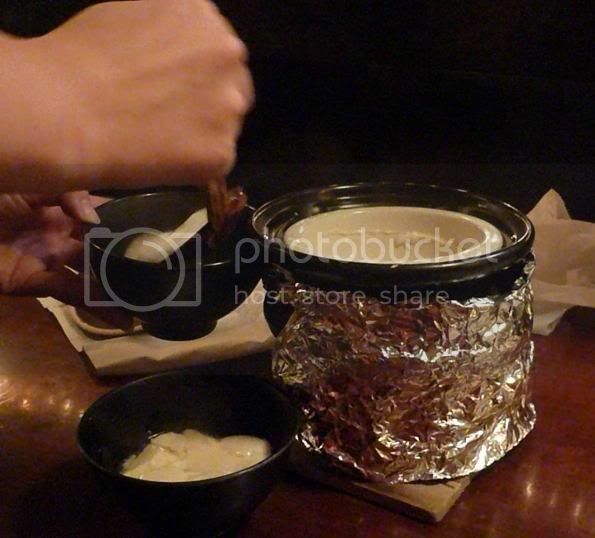 Is the daiginjyo tofu made with sake? Usually it's a term reserved for top shelf sake. 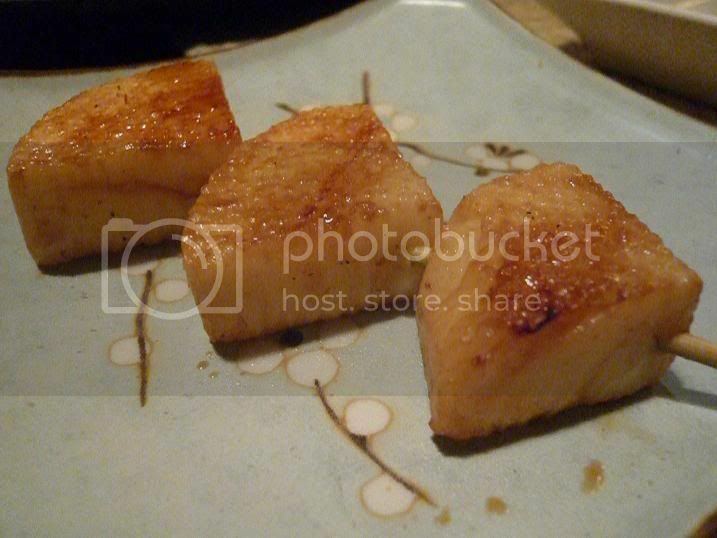 Also, I've heard that the best sushi chefs are rated by their tamago. Although you probably know that too, seeing as how we read the same book. I know this wasn't a sushi restaurant, but from your description, it sounded like the tamago was closer to pound cake than an omelet. 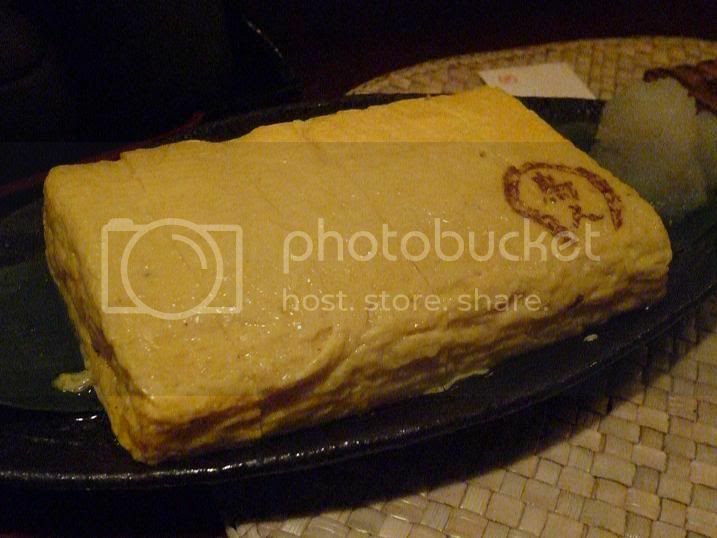 I mean, it's tamagoyaki. And great tamago at that. Some people prefer the salty version and some, like me, prefer the sweet one. But yep I remember that part of the book and agree! Oh I would love to try all those dishes. Gee, I usually throw that chicken oyster away, I have to do some research on that. I might be missing out on a delicacy. Love their serving plates there too. OMG...isn't Totto the greatest place on earth??? I'm so jealous you got to try the seseri. I want to go back soooo bad! too bad i moved out of new york! 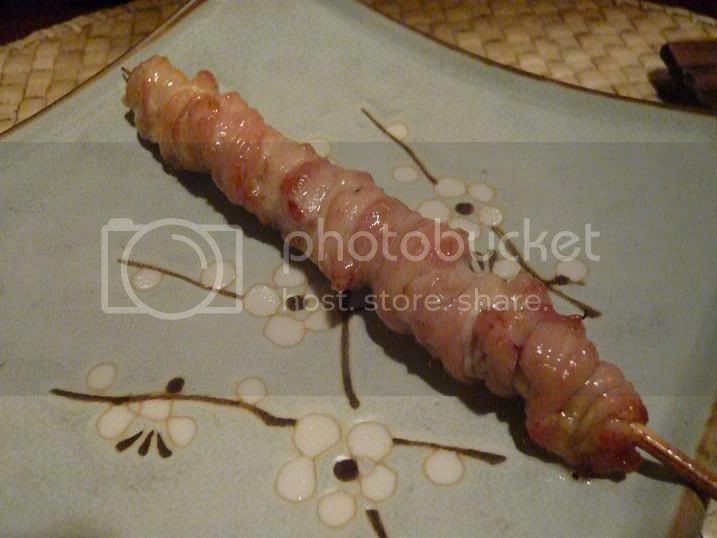 I love nagaimo, how good were those? also, the miso eggplants are brilliantly delicious. I would really like to try chicken oyster but it just doesn't look right. daiginjyo tofu is one of my favorites. extremely delicious. Hmm... looks like you made much better order selections than I did. Glad you liked Totto.